A hu ge THANK YOU to Children in Need! 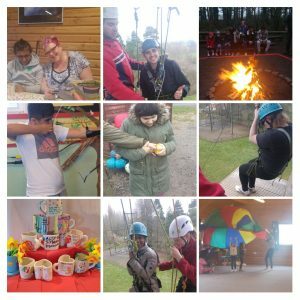 “I have to say when I first got told I had a mixture of thoughts but the lowdown of it was I was excited and happy to meet other people with Alström that I hadn’t seen since the last clinic the previous year. I’m not a confident rock climber but I think that the weekend had something for everyone of all ages meaning both young people and parents enjoyed it. As I have put above we went rock climbing with a few people getting to the top. Some people did the high ropes which are like a high up rope bridge with bin like tunnels and spider like webs of ropes to get through to the end and back. With the people who did it they were scared at first but by the end they were all trying to do cool tricks with the ropes they had got used to it. We also went on a very muddy walk avoiding golfers that seemed pointless for all the young people who have Alström as I made the point of saying our parents were literally dragging us through the mud to get a nice view, but we enjoyed the nature, mud and collecting of pine cones. We also went on a bouncy castle assault course that ended up being massive fun and creative trying to explore through it and how to muck about. If I had to describe it, the main one was going through a blue or red whole which you had to pull your body through like a worm then go up and under these rungs and then go up a hill that is almost impossible to climb unless you have support on the other side because I admittedly started it and fell off with giggle! You then had to go down a slide and then find these large pillars that are like the brush bit of a toothbrush that you can start walking through but I almost got pushed onto the outside wall and got easily stuck so I find it is best to slide through like a snake through the undergrowth just to get the stomach muscles pumping. 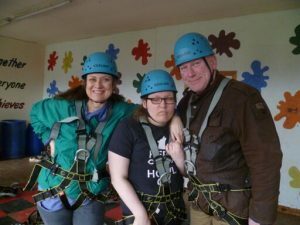 The reason I was honoured to write this was to give my top tips on one of the more intimidating activities – zip wiring. It’s one of those things you love to hate. I personally don’t like it sometimes it’s because with the small amount of sight I have there is sometimes a contrast between the strip of wood you’re stuck as a statue on and the whiteish gravel covered the ground very far below. Luckily at the weekend, thanks to my colour blindness, it was practically camouflaged. What is really nice is with the experience they had people overseeing the activity so your safety is in good hands. They’ll tell you what ropes you can grip onto with your life and what they want you to do at the end. I find once they do this with you the only and best thing you can do is to lean into your harness and with your bent legs, walk to the edge until your feet are about half way off, and when you can feel yourself going with it then go with it. It’s all you can do. It makes you feel like you’ve left your stomach up there even more with the strange jerk near to the end but at the end of the day you do enjoy the thrill of it deep down. This way definitely works because it was the first time this weekend I did it twice. I had a great time with everyone and I looked forward to the next opportunity to seeing other people with Alström”. For many young people and their families the Pioneer Centre weekend and others we have organised have made a real difference to their lives, one Mum said ‘I didn’t believe it was possible to watch my son whizzing down a zip wire on his own-I now know he can do so much more than I thought!” The project has helped young people to develop their own confidence and speak up for themselves. Building on the success of this project we are delighted to have received a further 3 years of funding from Children In Need to continue working with young people and families through the transition stage. This means we can continue to support young people with AS through the use of support groups such as ‘Hear My Voice’ and an ASUK resource called T-KASH (Transition-Knowledge And Skills in Health). T-KASH was developed with young people; it aims to enable young people to feel more confident about their future and build positive relationships with peers and healthcare professionals. For more information about T-KASH and other resources we have developed thanks to Children In Need funding click HERE.